The name says it all! My fabric, my family and other fun things in my life! I don’t know how I should organize the posts. So it might be mishmash craziness that will span over a couple days. 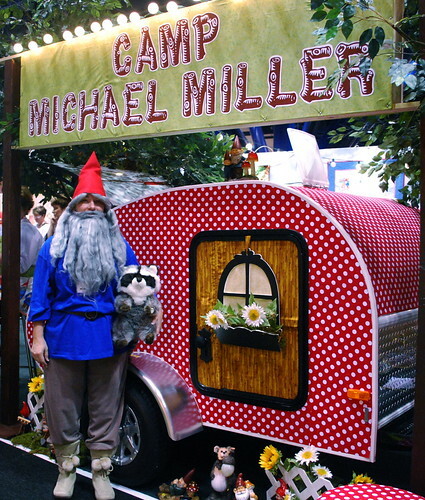 First – the Michael Miller booths! Camp Michael Miller pretty much sets the tone. 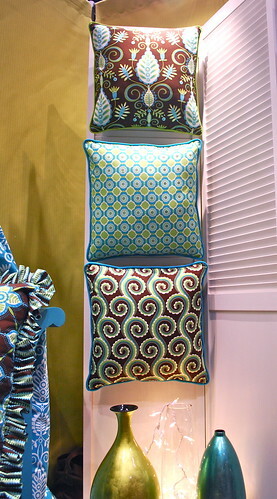 The prints I love are fun and playful, just like their booth. In addition to new fabric lines, they all have new patterns too! I have Patty’s newest patterns in the store now. Sandi is expecting hers to be ready in November and Paula says around the new year. Also Valerie Pillow and Anne Maxfield said their website, blog and such should be up before too long! I have some goodies for you guys… you’ll definately want to check back. But right now I am falling alseep on my computer desk – so it’s time for me to get some much needed sleep! See you again soon with more quilt market fun! wow What fun!. I wish sooo much that I was in this side of retail(we sell groceries) , so I could go to quilt market. Thanks for sharing photos. I love the glimpses. It’s a lot of fun and very inspiring. I wish that everyone could go and see it!!! I’m glad to hear that! I will have the whole line…and you’ll definately want to check back on the blog later this week…..there might just be a wee little sweet suprise. this is such a tease – gimme more!!! 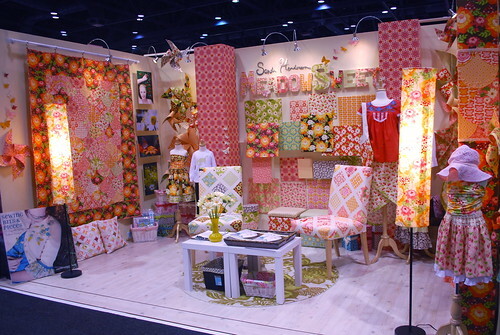 Sandi’s booth gave me goosebumps!!! You know me – always a tease. 🙂 I figure I have to spread it out….for my own mental well being! Goodies, for me?? You know, I couldn’t have saved you the trouble and just taken some of those goodies off your hands in Houston…he he. Ha ha ha – yes, you could have snuck a few little goodies into your suitcase….maybe I should go count right now and make sure none found their way there. oh I hope there is gnome fabric! squeak! ha ha – a fan of gnomes I take it? Thank you for including everyone in your Quilt Market fun! 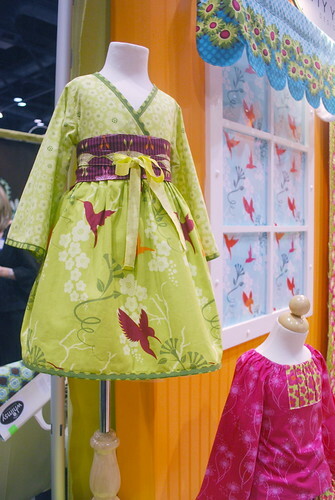 So many beautiful fabrics and creations! Pstty’s hummingbird print is so striking and I love every piece of Sandi Henderson’s new line! Who designed Whimsy? I don’t think I’ve seen it yet and those are my favorite colors! Looking forward to seeing all the pieces in your store! Can’t wait to get some Meadowsweet!! Me too! It’ll all be here before long! And actually….well I dont’ want to give anything away – but check back on the blog soon…..
love patty’s quilt!! can’t wait for her new line to come out; love the stone & turquoise! You’ll need to come to my house soon – I have more stuff to show you in person too…. with the intensity of drugs used as treatment. by most. Many men choose this like a graceful way to bald and merely get it over and done with. When someone writes aan piece oof writing he/she keeps the idea of a useer in his/her brain that how a user can know it. Hi! I love fabric, I adore my family and I seem to think my life is pretty dang fun! So welcome to my blog. Enjoy your stay and visit often! Tell me when the Knits arrive! Copy and Paste the hmtl below to add my button to your blog! You can subscribe to my blog by email so you'll be notified when I update! When will the Knits arrive?